Barbie dream house opened in Berlin. The little children are happy. Feminists are aghast and protest against sexist Barbie. Her curves are unattainable by the average woman, thus Barbie ought to be abolished. We suspect that children will be seriously traumatized seeing pictures of Barbie crucified and burned alive by a naked woman that looks like Barbie. 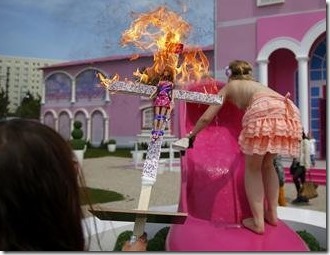 Feminists burn witch Barbie at the stake., for being too attractive. We are speechless and rest our case. Even Barbie is being attacked!